Thanks to two Beyerkohler descendants, Kurt Kohler, and Mark Soltysiak, for information they have provided on the Beyerkohler family. Kurt Kohler is a descendant through Martin Beyerkohler and Mary Loeffler Beyerkohler's son, Conrad Beyerkohler. Mark Soltysiak is a descendant though Martin Beyerkohler's son, Charles Beyerkohler and Catherine Lindemann Beyerkohler, later Van Loo. Information supplied by Beyerkohler descendant, Kurt Kohler, is entered in blue type. Information supplied by Beyerkohler descendant, Mark Soltysiak, is entered in green type. Marriage: Marie Loeffler in 1870. See below. Johanna (Hanna) Loeffler (later called Beyerkohler) circa 1861 in Bavaria per 1870 Census - in Germany per death record - daughter of Marie Loeffler per immigration in 1870. 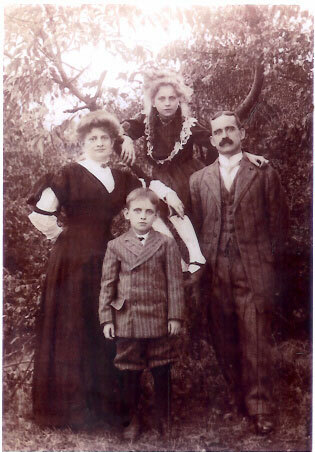 Charles Beyerkohler, the son of Matin Beyerkohler and Unknown, was born in Bayreuth, Bavaria, Germany, circa 1864/65. While the marriage certificate of Charles Beyerkohler listed Martin Beyerkohler as his father and Mary Loefffler as his mother, Martin Beyerkohler didn't marry Mary Loeffler until 1870. The death certificate listed another initial, not M for the father of Charles Beyerkohler. Gompers, Seventy Years of Life and Labor, vol. 1, pp. 44-45. Immigration: Charles Beyerkohler's death record indicates that he immigrated in 1873. He was not listed with Martin, Mary, and Johanna in the 1870 census. I did not find an immigration for Charles (or Karl) Beyerkohler circa 1873. Catherine Lindemann and Charles Beyerkohler were married on May 19, 1888 in the Deutsche Evang. Kirche on Madison and Montgomery Street. The Church records lists, Karl Beyerkohler, 23, occupation "segarbox manuf" born, Bayreuth, Bayern [Bavaria], 244 Third Street between Ave. B & C, to Katherine Lindemann, 22, (?) born New York, 244 3 Street, witnesses, Louis Jacob, Jersey City and Henry J Metz. Minnie born October 3, 1888. Note: I did not find the birth of Minnie Beyerkohler in the NYC records. Births before 1900 were frequently not recorded. Marriage: "Jacob Westrich (born Aug. 8, 1882) in the lower east side of Manhattan"
Mildred Catherine born September 25, 1913, Brooklyn. 1920 Census: East 3rd Street, Manhattan, Mina Westrich head age age 30, married, examiner clothing, Marie, daughter, age 7, Mildred, daughter, age 6, Louis, daughter, age 3 and 11 months. All born NY. Death of Jacob Westrich: 1935 # 9153 Manhattan, Jacob Westrich, age 53, died April 19, 1935, 9153 Harlem Hospital 136 and Lexington, "single"
Note: From at least 1890 to 1894 Peter Goehle and his wife, Minnie Lindemann also lived at 88 Sherrif Street. Minnie Lindemann Goehle was Catherine Lindemann Beyerkohler's sister. See Catherine Lindemann Beyerkohler Van Loo now or at the bottom of the page. Birth of Mary Loeffler, wife of Martin Beyerkohler: Unknown, circa 1842, Germany. Martin Beyerkohler, age 33, 43 Clinton Street, born in Germany, bakery, father, Johann Beyerkohler, mother, Catherine Meyer, married Maria Loeffler, of 43 Clinton Street, age 28, born in Germany, father, Frederick Loeffler, mother, Christine (?) first marriage for both of them, February 29, 1870. The date was entered several times and each time the day was blotched. Witnesses: Ernst Valy and Maria Kolb. Ceremony performed by Theo Frieder (both the given and surname are hard to read), Residence, 129 Norfold Street. The marriage record of Martin Beyerkohler and Mary Loeffler in 1870 say that it was the first marriage for both of them. 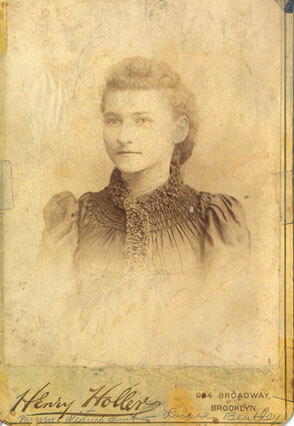 There was at least one child, Hannah (Johanna) born circa 1861 to Marie Loeffler. At the birth of Mary Beyerkohler in 1873, Mary Beyerkohler, senior, was listed as the mother of 5 children. One would be the daughter Mary. Two would be Johannna born circa 1861. Another known child was George born 1870. Who were the other two? Note: Martin Beyerkohler and Mary Loeffler were married February 29, 1870. It appears that George was born less than 5 months after the wedding. This was a rather common occurrence and was not necessarily looked upon with derision. Pregnancy before marriage was frequently looked at as a proof of fertility. Richard William Beyerkohler, 207 Eldert Street, age 22, single, salesman, born Brooklyn father, George, mother Henrietta Riez 1st marriage married Henrietta Price, 21 Floyd St, age 22 single born NYC, daughter of Thomas Fenton and Josephine Goewery 1st marriage St Mary's Brooklyn 220 Classon (?) Ave, 21 December 1912. Witnesses: Edward J Fallors, and Alice Yates. George T. Age 92, of Stevens Drive, Gilliett, PA, died Monday, October 9, 2006, at DeKalb Community Hospital, Smithville, TN. George was born April 13, 1914 in Brooklyn, NY, son of the late Richard and Henrietta Price Beyerkohler. He was married to the late Dorothy Wolff Beyer, who died March 31, 2004. George was a veteran of WWII, serving his country from 1942 to 1945 with the US Army Air Corps. He retired in 1979 from the George Tiemann & Company, Long Island City, NY, where he worked as a manager of warehouses. George was an avid sports fan and followed the Brooklyn Dodgers for many years. Survivors include his brother, Richard Beyer of Lindenhurst, NY; nephews, Bruce Beyer of Irving, TX, and Donald Beyer of Lindenhurst, NY; cousins, Warren Ponds of Liberty, TN, and Alan Coker of Miami, FL; many friends and neighbors. Family and friends are invited to call from 9 to 10 a.m., Saturday, October 21, 2006, at the Roberts Funeral Home, Inc., 279 Main Street, Wellsburg, NY. Funeral Services will be held Saturday, October 21, 2006, at the conclusion of calling hours at 10 a.m. with Reverend Donald Matthews officiating. George will be laid to rest next to his wife, Dorothy in Checkerville Cemetery, Gillett, PA, immediately following the service. Tri-Counties Genealogy & History by Joyce M. Tice Checkerville Cemetery, South Creek Township, Bradford County, PA Obituaries"
I talked to Lillian once. She is in her eighties and married Robert (Bob) during the 1970's. It was a third marriage for both and she knew little other than Roberts brothers names/addresses. Robert was the son of Richard and Henrietta. Richard was the son of George born to Martin and Maria on 7/4/1870. Robert has surviving brothers, George and Richard, they shortened their names to Beyer before WWII." Mary (Louise), July 11, 1873 married William Henry Bentley Jr.
Louise Gertrude Beyerkohler, 669 Broadway, Brooklyn, age 22, 1st marriage, born NYC, father, Martin Beyerkohler, mother, Mary Loeffler, married William Henry Bentley, Jr, 669 Broadway, Brooklyn, age 25, 1st marriage, carpenter, born NYC, father, William Henry Bentley, mother, Harriet Seaton Mansfield, witnesses, Mamie Stewart, and A E (?) Bentley. Ceremony performed by Cornelius L Turing, Calvery Church, 185 Manor (?) Avenue. Mary born in 1873 was listed as the 5th child born to Mary Loeffler Beyerkohler and Conrad born in 1875 was listed as the 6th child born to Mary Loeffler Beyerkohler. This does not allow for another child born between Mary in 1873 and Conrad in 1875. See birth of Conrad Beyerkohler below. Particularly in the German community where children were often given five or six names at birth, a different name was used later in life. WWII Draft Registration: Harold William Bentley residence, Lyons Place Westwood Bergen New Jersey, Telephone, Westwood 1026, age 45, born Brooklyn, New York, Kings County, October 15, 1896, Name of person who will always know address, Mrs. Marjorie C. Bentley, Employer, Abbott Proctor and Paine, 14 Wall St. NYC. See pictures of Louise Beyerkohler Bentley at bottom of the page. Note: Originally the address was listed in two different places on the records as 97 Sheriff Street. In both place Sheriff was crossed out and Willett was entered. This could indicate a recent move. Was Walter E. Bentley, the vicar at St Mark's Church, related to William Henry Bentley, Jr. and A. E. Bentley, the groom and witness at the marriage of Louise Beyerkohler in 1896? 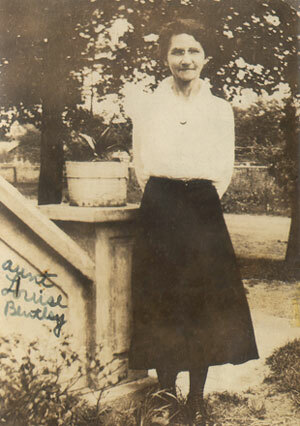 Margery was mentioned frequently in the Brooklyn Eagle social columns. Marriage: June 1918 Clarence Mattison Shinkle, both of East Elmherst at the Leverich Memorial Chapel. Birth: Louis Conrad Beyerkohler, September 16, 1901 124 E 11th Street to Conrad Beyerkohler, born US, age 26, US PO clerk, and Margaret Beyerkohler (no maiden name given) age 21, second child both living. Death: April 1952, suddenly, son of Mr. and Mrs. Conrad Beyerkohler, father of Conrad Kohler of Columbus Ohio, and brother of Margery Beyer Zeiglar. According to the birth record of Anne Beyerkohler in 1877, she was the 8th child born to Mary Loeffler, see below. Note: The death certificates vary a little over time. This death certificate did not ask the name of the parents, only their places of birth. 1884 Naturalization Petition of Martin Beyerkohler: 28 January 1884 Martin Beyerkohler Court of common Pleas declaration of intention. Death of Martin Beyerkohler, 1890: Martin Beyerkohler age 54 years, 10 months, widower, occupation labourer, born Bayreuth, in US for 18 years, address 164 E 4th Street, died on March 16th of Pnemonia dextra (? ), paralysis cardis (?) Asthma bronchiate. There were no other Beyerkohler deaths between 1888 and 1891. Note: Charles Beyerkohler died in 1891. The Official Register of Postal Workers for 1907 listed Geo. M. Beyerkohler and Conrad Beyerkohler both in New York. Some of the Beyerkohles changed the name to Kohler while other changed it to Beyer. "I have an older relative that thinks all the kids were put in the Wartburg Orphanage up in Mt Vernon Westchester Co."
Bayreuth is a city in Bavaria, east of Wurzburg and north of Nurenberg. "Minnie Westrich's Aunt Louise Bentley" "Aunt Louise Bentley"